So, on realizing I was probably due to post this I checked my previous posts only to find that I either didn't post term 1 either, or it isn't linked to my above tab. I'm not sure which it is and I don't have time right now to figure it out. Term 1 is history now, though, right? I feel so "parked" in this era! Not in a bad way, though, but because there is so much to study. We are reading about Wallace and Bruce (circa 1200), and Columbus (circa 1500), so this artist is a perfect fit. 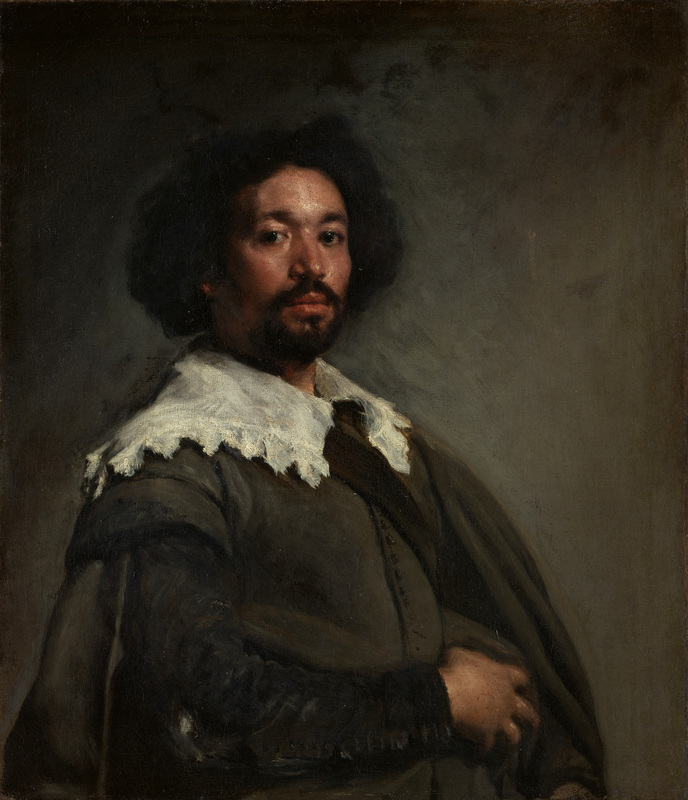 Learn more about Diego Velazquez HERE. Six paintings are recommended for study of this artist. 6. Las Meninas (The Maids of Honor), 1656 - What I love about this one is the self-portrait of Velazquez embedded in the painting - he is painting a painting in the painting! Here is my menu plan for this week. 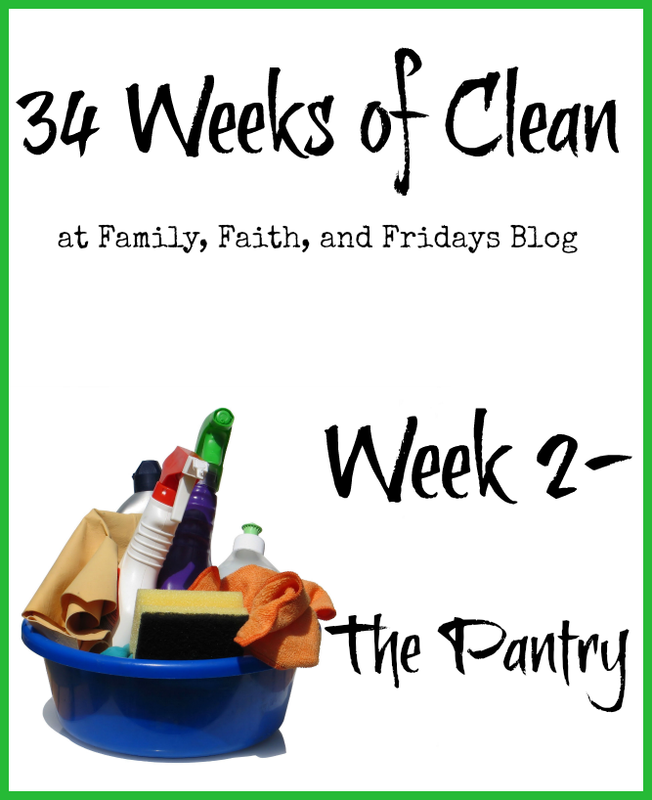 Okay, here is where my participating in the "34 Weeks of Clean" challenge becomes more of an attempt to humor my readers than to participate in the challenge. Let's just say I am taking a "By" week (or is that "bye"?). 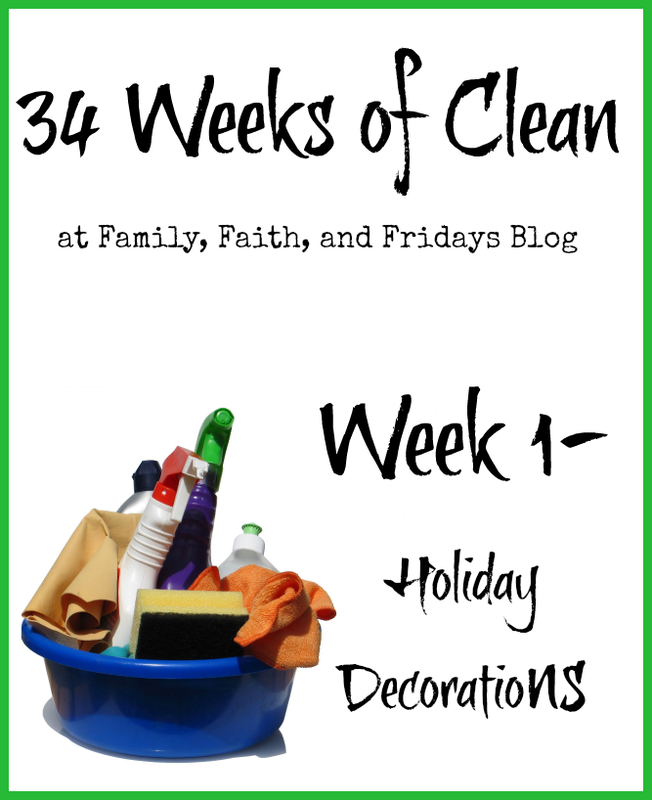 This post is a little late, and will be light on photos because I did Christmas clean up around here before I thought to post about it and join in the "34 Weeks of Clean" challenge at Family, Faith and Fridays Blog. So, one of our family traditions, implemented by mom and dad and not necessarily appreciated by the rest of the family is our practice of cleaning up our Christmas decorations on the 1st day of the year. This is practical for us because 1) it is a holiday, and therefore 2) everyone is home to help. We started by disassembling the tree onto the dining room table. From there we separate ornaments according to who they belong to. I came to see the wisdom of this method about a decade ago, when my oldest was approaching adulthood. It had occurred to me that at some point each child would be setting up their own household, and they (and I) would want their personal ornaments to go with them. These ornaments start with ornaments they made at co-op ornament events, and expanded to include specialty ornaments purchased for each of them each year. I certainly cannot keep track of what belongs to whom, and boxing them each year means they are "labelled" the next year when they come out of storage, and that helps us to eventually keep them with the right kiddo. Once the tree is "empty", we drag it outside. Usually, as we dump it off the side of the deck toward where it will go out the gate for recycling, another ornament(s) is found on the tree. This year was no exception. Didn't break, though, so all was good. Effort is made to locate and put away every decoration. When the decorations were brought out, other decorations were stored (in the Christmas storage boxes) to make room for Christmas. These non-Christmas decorations are returned to their normal "homes" as the manger scene, et. al. are put away. Sometimes, no matter how hard you try, you keep finding little decorations here and there for weeks! So, I'm not sure if I'll manage to do this with all the products I review this year, but I just got word that I'll get to review a really great product by Heirloom Audios, a dramatic audio presentation of G.A. Henty's story, In Freedom's Cause! Review will post in mid to late February. Watch for it! So, I though of not posting a "WORD" for 2015. I mean, last year I posted my word for the year as "INTENTIONAL", and as the year spun past (somewhat out of control), the real word seemed to be "SURVIVAL". 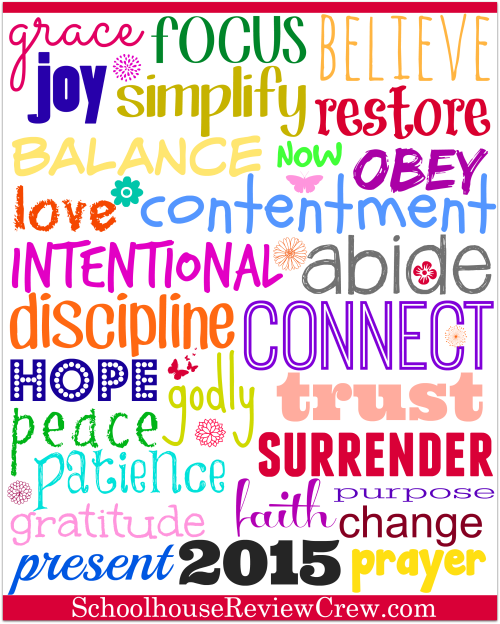 For the year 2015, I have concluded that my word needs to be "DILIGENCE". There were many words competing for the first place slot. I considered "flexibility", but my brain was translating flexibility (in my situation) as "lazy", or at the very least, "disorganized". "Enthusiastic" is a word I need, but don't see myself able to achieve this year. "Encouraging" is in the same category (particularly respecting my home schooling). I'm trying, but these certainly aren't words for the year. As we finish 9th grade this summer, I am already considering ways to do 10th grade differently. I am wondering if I can get "The Boy" to take some outside classes this time, like maybe Geometry or Algebra II, and/or Chemistry, Spanish (...::sigh:: ---everything?). As I begin this, my 23rd year of home schooling, it would be fair to conclude that I'm ready to be done home schooling. I've been there, done that. It's hard to stay excited, to be there for my son as he experiences high school Biology class for the first time, watching a video of a puff ball mushroom exploding under someone's foot. For the most part, my student is finding his encouragement through excelling in his grades, which makes my job of correcting school work important. It needs to be done, and it needs to be done quickly. So that brings me back, once again, to "DILIGENCE". I need to be diligent in planning, implementing, and following up on our school work. So, there you have it. Here is my carnivore/vegan menu plan for this week. My son plans to join me in efforts to eat vegan. Part of this week's plan includes eating vegan from the freezer. The freezer currently contains "macaroni and not cheese", as well as some other previous meals in individual portions. Fridge has pasta with mushroom sauce. I got the new cookbook by Ann Esselstyn for Christmas; page numbers below refer to that cookbook.